This charming renovation is loaded with ideas and inspiration for your next small-spaced remodel. 5 Outdoor Rugs-- You'll Love Indoors! The problem with today's outdoor rugs? They're almost too good to keep outside! Durable, sophisticated and downright gorgeous, this new generation of patio and deck rugs are nothing short of a game changer. ....and just beg for an opportunity to show what they can do inside your home,too! While browsing through a recent issue of Coastal Living, I found the perfect accessory for our busy phase three home: The Kevo Smart Lock, a bluetooth enabled deadbolt by Kwikset. And if you're in the third stage of your life as we are, you'll immediately understand exactly why it's such a great fit. 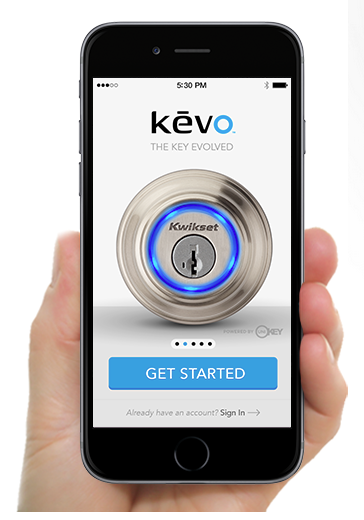 This system turns your smartphone into a house key so you can open your door with the touch of a finger. And lock it just as easily once you're inside.